Andersson, P.. (2018) Kina i Arktis – intressen och strategier. Föreningen FokusKinas Tidskrift, 4, 34-38. 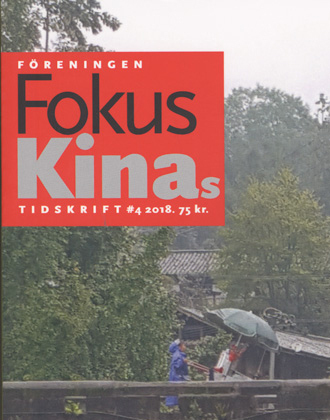 The FokusKina magazine (formerly China Report) is aimed at anyone interested in China. This is the only magazine in Sweden that focuses on China and where many of Sweden’s most knowledgeable writers participate. The magazine is a treasury filled with information, knowledge and insight into what is happening in China today, and about the old culture and tradition on which today’s explosive development is based. FokusKina’s magazine reflects the great political, economic, social and cultural changes that are taking place in today’s China. Current analysis is interspersed with retrospective articles that highlight parts of a long and fascinating story. Here are texts about history, archaeological finds, art, music, literature, politics, society’s changes, adoption and environmental issues as well as interviews, reviews and articles on food culture with recipes and a recurring language gap.